The past, present and future of late-night TV were all on view on Friday night’s Letterman show. From out of the past -- seemingly -- came a musical performance that was as close to the sublime as television ever gets. It was an opera star -- Jessye Norman -- singing “Midnight Special,” a plaintive, bluesy folk song thought to be about 100 years old. Norman, 69, sat on a stool on the “Late Show” stage, accompanied by a man seated nearby who played an acoustic guitar, and brought the house down. She wasn’t loud -- just authoritative, in the way that only veteran artists at the top of their games get to be. If you missed this performance, do yourself a favor and watch it here. David Letterman is a veteran artist too -- a veteran of the art of broadcasting -- as he has been demonstrating in spades recently. Some critics (okay, me) have run hot and cold with Letterman over the years -- complaining at those times whenever Dave was coming across as aloof and disinterested. But lately, he has been supremely in command. Perhaps it’s because he’s become comfortable in his status as TV’s late-night host emeritus – the ranking he earned when Jay Leno ended his run last February on “The Tonight Show.” Or maybe he really does want to savor every moment of these shows in his final season on TV. He won’t be saying his final farewells until well into 2015 (CBS hasn’t announced his farewell date, but most bets are on next May or thereabouts), but he is about to enter his final holiday season as the host of “Late Show.” Pay particular attention to this date: Dec. 19. That’s when he’ll have annual guests Jay Thomas and Darlene Love on the show for the last time. Thomas will deliver the yearly rendition of his Lone Ranger story -- a yarn that never gets old. And Love will sing “Christmas (Baby, Please Come Home)” for one final time -- as she has done every Christmas season on the Letterman show (including NBC’s “Late Night”) since 1986. In the same vein, Friday night’s performance by Jessye Norman felt like a throwback to a time when, every once in a while, a TV show wasn’t afraid to class itself up and, in the process, create something memorable. Or to put it another way, if Norman went on the Fallon show (which would likely never book her anyway), she would probably be required to exchange pies in the face with Jimmy. When Corden came on the show, I almost immediately observed that this guy looks like an English Andy Richter -- something Letterman himself remarked upon just a few minutes into their first segment together. Who knew Letterman was even aware of Andy Richter? Hopefully, somebody has told Andy this. It was Corden’s first appearance on “Letterman” and was clearly an opportunity engineered by CBS to introduce Corden to an American late-night audience that had likely never heard of him before he was announced a few weeks ago as Ferguson’s replacement. Letterman was generous with Corden -- giving him ample time to tell stories about his wife and his father, among other topics. He came on a little too strong when he first came on stage, but he seemed to settle down eventually. It was difficult to discern what Letterman thought of him. As it happens, Letterman’s company, Worldwide Pants, won’t be producing Corden’s “Late Late Show.” Instead, production will revert to CBS Productions, another sign that the Letterman era is coming to a close at CBS. Near the end of the show, when Norman was finished singing, Dave walked over to thank her. “I hope you come back,” he said graciously. “I look forward to it,” she answered, though it was doubtful it would ever happen between now and the end of the Letterman show next year. 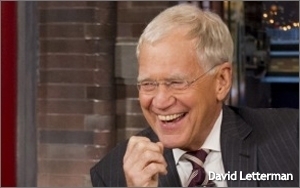 2 comments about "David Letterman Still Making Midnight Special, But Not For Long". Chuck Lantz from 2007ac.com, 2017ac.com network, November 24, 2014 at 4:32 p.m. Losing both Letterman and Ferguson is painful as hell in this household. No other current late night show comes even close to those two, and unless there's a full frontal lobotomy somewhere in my future, I won't be watching any of them. Karma Martell from KarmaCom Inc., November 25, 2014 at 12:12 a.m. I totally agree about the memorable Jessye Norman performance. Totally pro, totally magnificent. Indeed a "midnight special" that only Letterman would have the taste and class to present. I remember his introducing the then unknown Esmeralda Spalding. I was entranced and truly grateful to discover such a huge talent. Thank you David and Paul for the musical memories.